To assess the diverse environmental impacts of land use, a standardization of quantifying land use elementary flows is needed in life cycle assessment (LCA). The purpose of this paper is to propose how to standardize the land use classification and how to regionalize land use elementary flows. In life cycle inventories, land occupation and transformation are elementary flows providing relevant information on the type and location of land use for land use impact assessment. To find a suitable land use classification system for LCA, existing global land cover classification systems and global approaches to define biogeographical regions are reviewed. A new multi-level classification of land use is presented. It consists of four levels of detail ranging from very general global land cover classes to more refined categories and very specific categories indicating land use intensities. Regionalization is built on five levels, first distinguishing between terrestrial, freshwater, and marine biomes and further specifying climatic regions, specific biomes, ecoregions and finally indicating the exact geo-referenced information of land use. Current land use inventories and impact assessment methods do not always match and hinder a comprehensive assessment of land use impact. A standardized definition of land use types and geographic location helps to overcome this gap and provides the opportunity to test the optimal resolution of land cover types and regionalization for each impact pathway. The presented approach provides the necessary flexibility to providers of inventories and developers of impact assessment methods. To simplify inventories and impact assessment methods of land use, we need to find archetypical situations across impact pathways, land use types and regions, and aggregate inventory entries and methods accordingly. 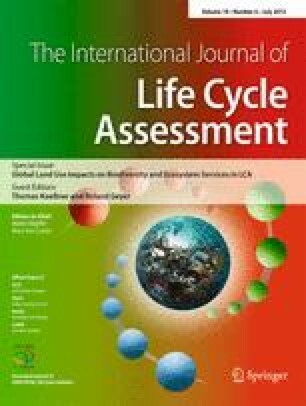 The authors wish to thank the UNEP/SETAC Life Cycle Initiative for the financial support of this work under the project Operational Characterization Factors for Land Use Impacts on Biodiversity and Ecosystem Services in the Life-Cycle Impact Assessment (LULCIA). The research was partly funded by the European Commission under the seventh framework program on environment; ENV.2009.3.3.2.1: LCIMPACT–Improved Life Cycle Impact Assessment methods (LCIA) for better sustainability assessment of technologies, grant agreement number 243827.